It seems as though we have finally seen the end of that hideous weather, which can only be a good thing. Roll on Spring and the start of race season, don't you agree? 001: I've had my eye on this Phase Eight Amalfi Dress for a while now, waiting for an excuse to wear it. What occasion could be more perfect? 002: I don't think you'd get away without wearing some kind of hat or fascinator - this Monsoon bow fascinator is even named Cheltenham, so that's probably the perfect choice, right? 003: The neckline of the dress really needs a necklace of some kind, in my opinion. I'd go for this Laura Lee Horse Agate Cameo, just to win extra points for the irony. 004: Any excuse for shoe shopping. Ordinarily I wouldn't match my shoes to the rest of my outfit, but I think on Ladies Day you're probably expected to. These Kurt Geiger Bryony Heels would do the trick. 005: And finally, this Marks and Spencer Envelope Clutch would be the finishing touch. Because not everything has to be matchy-matchy. 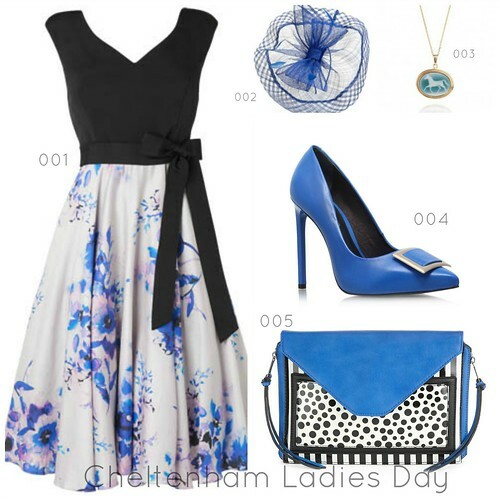 Have you ever been to Ladies Day? What would you wear? I sometimes think that there's more interest in the fashion side of things than the racing. That said, if you know a little more about placing bets than I do, you might have some success with the Ladbrokes Gold Cup. Do let me know if you enter! Phase Eight have so many beautiful dresses! How cute is that necklace too? I love this dress, beelined towards it when I was in Debenhams lately. Haha, betting is totally lost on me as well, I usually get someone else to do it for me. Oh, so very pretty! I would definitely wear a dress and feathery fascinator in scarlet with charcoal shoes and handbag. Good luck! I love your outfit.